Community hacktivism has long been at work in our city. While it might not have had a name in the past, community hacktivism is the ability of an individual or group to organize and then press on, often using unconventional methods or means to achieve the goal. In the case of how we have worked to preserve our parks over the last few years, in light of the devastating circumstances, this is a good thing. This act of stepping up versus stepping away is very much woven into the fabric of our city residents’ DNA. It is who we are. Our local parks system is one example of this. During healthier economic times in our history, many parks were created for our enjoyment and sufficiently supported and maintained. However, during the last ten years, and in light of the economic downward tick of the entire country, we had to get very creative in managing what we have. Part of our community hacktivism came in the form of leadership that was brutally honest about the challenges before us — and our need to approach these challenges with new eyes. In the mid-aughts, Mayor George Heartwell called a few times upon his fellow commissioners, local leaders and our neighbors to begin a series of community-led engagement projects that sought to produce new ways of addressing our valuable green spaces. The Mayor’s Blue Ribbon Task Force (MBRTF) and Green Grand Rapids (GGR) produced a couple initiatives. (Full disclosure, I was appointed to serve as a representative of the Second Ward by Mayor Heartwell.) Committee members as well as locals were called upon to explore new ways of creating sustainability for the city’s “green spaces.” In the case of the MBRTF, we looked at how to preserve our current parks and examined other models that could help shore up the economic shortfalls of a tightening budget. Many good things emerged out of Green Grand Rapids, including the DIT (Do It Together) organization and the Friends of Grand Rapids Parks, whose mission provided a platform to rally the community to step up and serve during our last downward economic cycle. Since 2002, there has been a drastic 70 percent reduction in our parks staff, according to the 2011 Comprehensive Audit Analysis for Parks and Recreation. Luckily, area residents rolled up their sleeves and got to work after maintenance budgets were slashed by more than 40 percent. There is no question it would have been far worse without groups like Friends, whose volunteers tended not only to our city’s 73 parks and public spaces spread over 1,210 acres but also to 378 acres of parkland just outside our city limits and the more than 350 acres that make up our school playgrounds (which count as green space in our inventory). Just during 2013, it is estimated that the Friends volunteers alone will contribute more than 10,000 hours in service to our parks, which translates to a $200,000 benefit for our parks. A new era of community engagement has taken hold here and we’ve witnessed a great surge to preserve our community’s green spaces. Alongside all these community hacktivists and Friends, many others have labored in large groups, performing massive river cleaning projects in the spring and fall. I’m grateful to those who pick up extra trash along their daily walks and to those silent but solitary individuals who, without prompting or fanfare, take it upon themselves to mow lawns at their neighborhood’s pocket park. But these actions, while necessary and vital to shore up the losses, are unfortunately not going to be enough to bring about the solutions we need to advance in the years ahead after a decade of depreciation on our parks from use. No matter how much trash we pick up or tending to green spaces we conduct, we are rolling backward when we are not investing in a system that is seeing record usage. Presently, when something breaks, because of a lack of funds to upgrade it to safe standards, the object or access is simply removed if it cannot be easily repaired. A walk through my neighborhood’s Huff Park nature preserve is a testament to these practices in what was once hailed as a shining example of a modern nature preserve where “access for all” was built in, including signage for the blind. My neighbor uses a walker to navigate the park because of his amputated leg. Hopping on one leg and steadied by his walker, he often stops me (and others) as he reaches the halfway point in Huff Park for advice as to the status of the boardwalk just ahead of him. Sadly, more and more he is turned away from the path he would love to enjoy because it is too dangerous for him to proceed. If we are to take the gifts of our small pocket playgrounds and pools entrusted to us from past generations forward into the future, then we will have to be open to a park millage â a solution that many other cities have found to be successful models for shoring up the deficiencies. On the surface, any talk of a millage is difficult. But I am of the belief that if you are a firm in Grand Rapids and are in the business of retaining talent (and who isnât these days? ), then a financial investment from where you sit is a no-brainier, considering the benefits. When one talks of modern cities it is hard not to hear names like Millennium Park in Chicago or New York’s Central Park. It is hard for some to imagine how a parks initiative arrived on the ballot before other pressing matters like a surface streets improvement millage until you consider that the citizens who make up Neighbors for Parks, Pools, and Playgrounds (NP3) have conducted nearly five years of research into this initiative. On its “Yes GR Parks” website, NPC has explained how millage funds would be invested back in our community. If enacted, the millage would be for seven years at a rate of 0.98 mills and would sunset on June 30, 2020. Fifty to 60 percent of the funds would support rehabilitation and repairs (approximately $2.2 million); between 30 â 35 percent (approximately $1.2 million) would be for capital improvements and grant matching funds to be applied to projects like new neighborhood parks, nature trails, boardwalks and recreation acquisitions; and between 10 and 15 percent (approximately $600,000) would be devoted to expanding our pool season to a full 12 weeks, which would include hiring of lifeguards, updating pool equipment and the purchasing of chemicals. These numbers are helpful, but the most important item to remember is that, as citizens of our city, we are all impacted by our parks, and we will be impacted by them negatively if we allow them to decline to the point where we must abandon them, as surely will be the case. Already the latest city audit of our parks, according to NP3’s Michael Lomonaco, has revealed that we should have closed nearly 50% of our parkland, with the majority of our parks receiving a C grade or less. The time to shore up the deficiencies is now. As we survey the backlog of repairs, even with all our volunteer hours and current reduced operating budget, we still are facing a $30,000,000 price tag. If we do nothing and decide not to adopt this millage, at the current rate of repairs it will take an entire generation to catch up on this tab. On the other hand, passing the millage would create many positives for the city. Not only could we restore our parkland in a timely manner, with all of us sharing the investment, but with each passing year (with greater and greater population growth in our city), we could garner a chance to showcase a vibrant and healthy mix of public space options. This is a win for a city that is always in competition not only to attract talented people but retain them as well. A healthy parks system often translates into greater interaction with the park setting — but it also helps ensure healthy and active neighborhoods, with plenty of options for recreation for all ages. With the passage of the parks millage on November 5, we will all be ensuring that we are a few steps closer to creating a city where everyone is just a few steps away from experiencing the power and magic of a well-maintained and beloved urban parkland. The Future Needs All of Us (but the present demands a vote to move forward.) Vote Yes! GR Parks. This week a fitting mix made just for October is in G-Sync Events: Let’s Do This! Editor’s note: A Pattern Language suggests that people who live near or frequent a park tend to be more likely adopters and not just users of this public space. Through their additional care they in turn are preserving what is there for future generations. For me, Huff Park, as illustrated above in the photos, shows not just the natural beauty but the alraming rate of decay from years of under-funding this gem within the city limits. 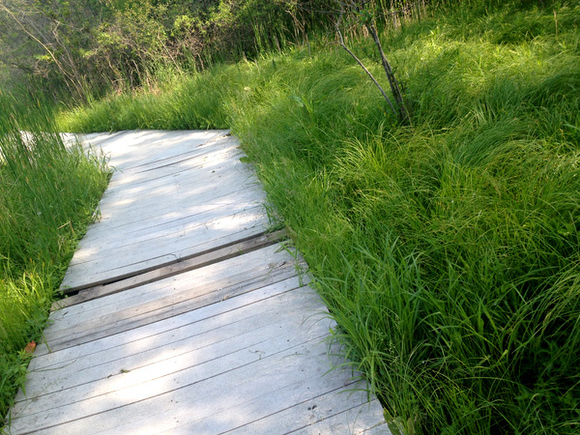 While planks are being replaced on a regular basis, the boardwalk is sinking and will very soon be more than just dangerous, as water presents other concerns beyond a slippery situation; it will have to shuttered to protect people who venture year-round to view the nature and animals who inhabit this space. All Images of Huff Park by Tommy Allen for Rapid Growth. In November 2013, Tommy will join fellow artists at the 22nd Annual Tanglefoot Bldg. Open Studio Event.